Lyle Hovde is at the onset of his golden years, living a mostly content life in rural Wisconsin with his wife, Peg, daughter, Shiloh, and six-year old grandson, Isaac. After a troubled adolescence and subsequent estrangement from her parents, Shiloh has finally come home. 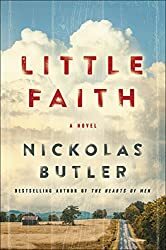 But while Lyle is thrilled to have his whole family reunited, he’s also uneasy: in Shiloh’s absence, she has become deeply involved with an extremist church, and the devout pastor courting her is convinced Isaac has the spiritual ability to heal the sick. While reckoning with his own faith—or lack thereof—Lyle soon finds himself torn between his unease about the church and his desire to keep his daughter and grandson in his life. But when the church’s radical belief system threatens Isaac’s safety, Lyle is forced to make a decision from which the family may not recover.